Kacey' s new life is eerily charming compared with the wild highs and lows of the old one she lived with her volatile mother. And everyone is so nice in Broken Falls—she' s even been welcomed into a tight new circle of friends. Bailey and Jade invite her to do everything with them. Which is why it' s so odd when they start acting distant. And when they don' t invite her to the biggest party of the year, it doesn' t exactly feel like an accident. But Kacey will never be able to ask, because Bailey never makes it home from that party. Suddenly, Broken Falls doesn' t seem so welcoming after all—especially once everyone starts looking to the new girl for answers. Kacey is about to learn some very important lessons: Sometimes appearances can be deceiving. Sometimes when you' re the new girl, you shouldn' t trust anyone. PLEASE DO NOT GO INTO THIS BOOK THINKING IT IS COMPARABLE TO PRETTY LITTLE LIARS LIKE THE BLURB SUGGESTS. IT IS SOOOO NOT. I had a love/hate relationship with PLL, mostly after things started to get old and predictable, after the fourth season. But I still watched it, and I was still highly entertained until the last episode. I read The Darkest Corners by Kara Thomas, and I liked it. I was intrigued by it, and I did not ever each a point where I felt like giving up on the book. In contrast, I felt like DNFing Little Monsters multiple times, but soldiered through it like the reading warrior that I am. That being said, this was one of those books where I would have been justified in giving up. Little Monsters felt like a rush-job pushed by the publishers in order to make some cash, and I hate books like that. The characters were one-dimensional, and I was bored by the MC. Characters were basically props for the red herring filled plot. I usually love red herrings, but this was formulaic. The book is incredibly slow-moving, yet seems completely rushed, and the characterization of “teenage girls” was, to be honest, offensive. Furthermore, I think the timing of this novel’s release is also a negative. We are in an era where YA authors are putting out powerful and diverse feminist fiction. Does all YA fiction have to empower teenage girls and address contemporary politics and social justice issues? No. But this novel paints an abhorrent caricature of young adult females, suggesting an outdated trope– that teenage girls are boy-crazed and will kill for a male’s undivided attention. That is soo last decade. 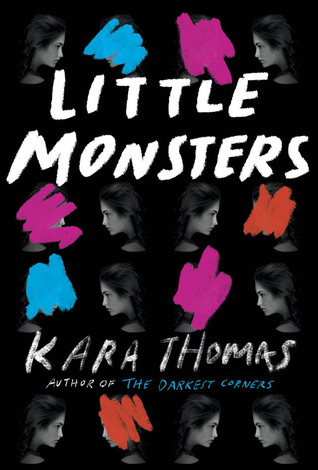 Have you read Little Monsters? Did you love it or hate it?